Sophie Koch was a student of Jane Berbié at the Conservatoire National Supérieur de Musique de Paris. She starts her career in France but it will be in London, Dresden and Vienna where she celebrates her first successes. Quickly, a mozartian career begins: Cherubino in Vienna, Madrid, Munich, London, Barcelona, Brussels, Dresden, Dorabella at the Festival de Salzburg, London, Munich, Vienna, Toulouse, Zerline at the Festival de Salzburg, Vienna, Munich, at l’Opéra de Paris, Strasbourg, Tokyo. Idamante in Berlin and Salzburg, Ramiro in London and Sesto in Dresden. For Rossini, Rosine in the Barber of Seville in London, Vienna, Dresden, Paris, Cenerentola in London and Dresden. Adalgisa of Norma in Munich, Avignon, Nice and salle Pleyel. She also struts male Strauss roles: the composer in Ariane of Naxos in Dresden, Munich, at the Baden Baden festival, Vienna, London, l’Opéra de Paris, at the Milan Scala, the TCE, Octavian in Der Rosenkavalier in Vienna, Dresden, Berlin, at the Festival de Salzburg, Munich, Barcelona, Monaco, Zurich, London, at the TCE, at the Baden Baden Festival. Joined by French romantic operas like Werther: Charlotte at l’Opéra de Paris, London, Chicago, Vienna, Munich, Brussels, Madrid, Berlin and at the Metropolitan Opera, Margared of the Roi d’Ys in Toulouse, in Paris (OC), Giulietta of he Tales of Hoffmann in Paris, Nicklausse in Vienna, Mignon in Genève, Avignon and Toulouse, Marguerite in La Damnation de Faust at the Festival de Grenade and in Dresden, Mère Marie in Dialogues des Carmélites in Nice, at Covent Garden in London and at the TCE. Brangaene in London, Fricka in Munich and l’Opéra de Paris, Waltraute and Venus in Tannhäuser at l’Opéra de Paris, Adriano in Rienzi at the Festival de Salzburg. 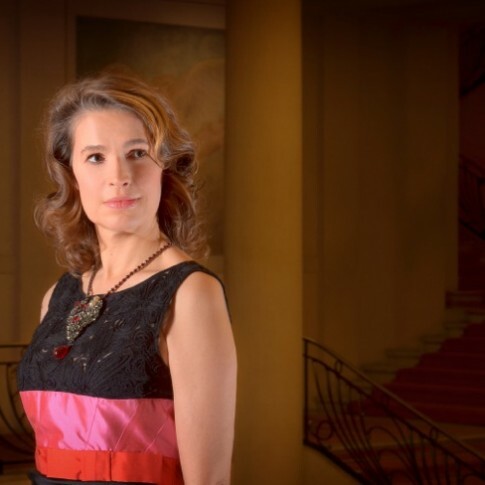 This season she is Octavian in Der Rosenkavalier and the composer in Ariane of Naxos à Vienne conducted by Christian Thielemann, Cléopâtre of Massenet conducted by Michel Plasson at la Filature de Mulhouse and the Théâtre des Champs-Elysées, Octavian at the Semperoper once again with Christian Thielemann, the composer and Guenièvre in King Arthur at l’Opéra de Paris and at the Festival de Salzburg this summer with Octavian. She is Coline Opéras patron. Her career as a recitalist is not less important; she has performed at the Festival de Salzburg, the Festivals d’Aix-en-Provence and Verbier, at the Brahmssaal/Wiener Musikverein, in Paris, London, Frankfurt, Munich, Strasburg, Dresden, Berlin, Luxemburg, Brussels and Madrid.